Rock Retreat is situated on the Stubbs farm. Which is a 1666acre working sheep and cattle farm nestled in the King Country, near Waitomo Caves, North Island, New Zealand. It includes over 800 acres of native bush reserved by a QEII covenant, along with North Islands key areas for bouldering and caving on classic limestone. Endangered species such as New Zealands Whitehead, Fernbird, Falcon and the North Island bat can be seen and rare flora and fauna such as Spiranthes sinensis orchids. Significant Moa bone finds and endangered/extinct bird species have also been found in various caves on the farm. Biddy grew up on the farm and the Stubbs family have lived on the farm for five generations. Harriet and Hugh Stubbs moved from Timaru, in the South Island in the early 1900’s. The old homestead still stands today and is used by the Auckland Speleological (caving) society as an accommodation for cavers and climbers. 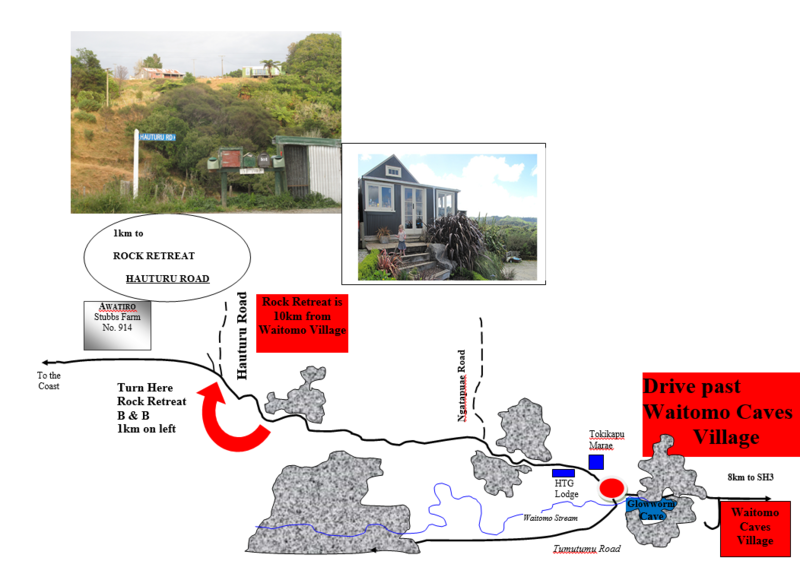 Drive 1km till you see the rock retreat signs. Designed by PC-Soft Limited. Copyright © 2015. All Rights Reserved.